We are so lucky that we have direct access from the school into the beautiful church yard next door. This allows us to make regular use of the Church as a place to worship as a whole school or to enhance our RE teaching as individual classes. The United Benefice Great Gidding with Little Gidding and Steeple Gidding is part of the North Leightonstone Benefice within the Ely Diocese, the parish lying in the north west corner of the Huntingdon Deanery. The Church of St Michael, Great Gidding consists of a nave, chancel, north and south aisles, west tower and spire with a south facing porch. A church has stood on this site for some eight hundred years. 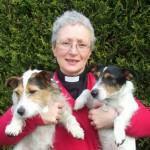 Our vicar is Mary Jepp and she is also our Foundation Governor here at school. Mary is very supportive of the school; spending as much time with us as she can, leading collective worship and supporting RE lessons.